Thanksgiving Day on Hilton Head Island need not be a lonely day for anyone! All are welcome to share turkey, dressing and all the trimmings at a free dinner held at Hudson’s Seafood House on the Docks. 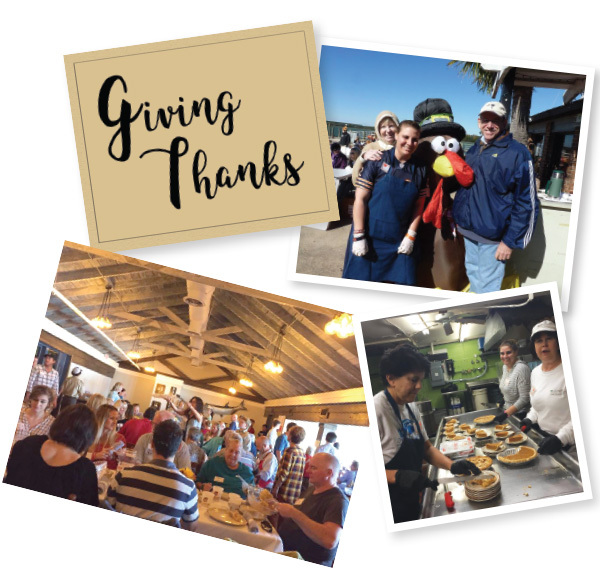 The Annual Community Thanksgiving Dinner on Hilton Head Island celebrates the free community family-style dinner, with over 400 volunteers serving more than 1,600 guests. For those who might be alone or unable to prepare a meal, it’s important to know there is a place to go to celebrate this holiday with others. The meal is prepared by Hudson’s Seafood House on the Docks at Skull Creek, with volunteers from the community to help serve the food. There will be lots of good fellowship and entertainment for a festive atmosphere. Transportation can also be arranged, if needed. This event is organized by St. Andrew By-The-Sea United Methodist Church and Hudson’s Seafood House on the Docks. Donations in the true spirit of Thanksgiving are greatly appreciated. Donations on the day of the event will go to The Deep Well Project and Bluffton Self Help charitable organizations. Along with their golden roasted turkey breast, Hudson’s past menus have included glazed ham, Miss Bessie’s braised ham hock collards, cranberry conserve, creamy “Turkey Spiked” whipped potatoes, sweet potato soufflé, house-made giblet gravy, cornbread stuffing, French baguettes, house-made banana pudding, holiday-spiced pumpkin pie and lattice apple pie. Hudson’s Seafood House on the Docks is located at 1 Hudson Rd., on the north end of Hilton Head Island. (843) 505-1370 or communitythanksgiving.com.